The Benjamin Franklin Awards™ have been honoring excellence in publishing since 1988. IBPA, the largest non-profit association of publishers in the United States, is pleased to announce the winners of the 2013 Benjamin Franklin Awards™. A complete listing of all of the Silver and Gold Award winners can be found on the IBPA website. More than 250 people gathered at the Marriott Marquis in New York just before BookExpo America to celebrate the 164 Silver and Gold Award winners of the 25th Annual Benjamin Franklin Awards™, chosen by 160 hard-working judges from almost 1,300 entries in 55 categories. The judges include booksellers, reviewers, librarians, and book designers, and they work from August through March to grade all the entries. This year’s competition was open to all books published in 2012. In keeping with IBPA’s educational mission, all entrants receive a written critique with advice on how to improve their publications as well as kudos for the good work produced. Honoring excellence in publishing annually since 1988, this year, the Benjamin Franklin Awards™ recognized publishers as large as Hazelden Publishing, in partnership with Harvard Health Publications, Gold winner in the Psychology category with their title Almost A Psychopath: Do I (or Does Someone I Know) Have a Problem with Manipulation and Lack of Empathy?, and as small as BillyFish Books, Gold winner of the Bill Fisher Award for Best First Book with their title The Expedition, Dark Waters: True Story of the First Human-Powered Circumnavigation of the Earth. 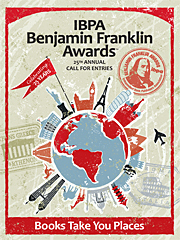 See the Benjamin Franklin Awards™ website for more information.